Congratulations to Jonathan Aguiar, Winner of Event #5: €10,450 Mixed Max - No-Limit Hold'em (€258,047)! Redemption. That was the only word on Jonathan Aguiar's mind as he played Brandon Cantu heads up for the bracelet in Event #5: €10,450 Mixed Max - No-Limit Hold'em. Aguiar, who stone bubbled in this exact event in 2011, was battling to redeem what he referred to as "the worst day of his career". After a six hour heads up battle on Day 4 and 45 more minutes on Day 5, Aguiar was able to seal the deal and defeat Cantu heads up, earning him his first WSOPE bracelet as well as a €258,047 first place prize. The final bracket of 16 did not disappoint in terms of powerful names from the poker world. Phil Hellmuth, Bertrand 'ElkY' Grospellier, Joe Keuther, Mike Watson, Jason Mercier, Paul Tedeschi, Vladimir Troyanovskiy, and Jennifer Tilly were all among those to make it to the heads up portion of this tournament, only to be eliminated in the first round. These players earned a payday of €20,443 for their performances in this tournament. The next round saw the exits of Kristijonas Andrulis, Martin Jacobson, Marvin Rettenmaier, and Konstantin Puchkov, all of whom took home €42,094. The eliminations of these players saw the formation of the final four. Aguiar took care of Jaka fairly quickly and was able to rest up for the final match. The match between Cantu and Roger Hairabedian, however, was a different story. The match lasted for roughly nine hours and saw much controversy. Tournament Director Jack Effel was called on two occasions to assess issues brought up by Cantu. The first involved Hairabedian moving to a different side of the table which Cantu did not think should be allowed. The second was ruled in favor of Cantu, and involved Hairabedian betting after he had already checked. These issues delayed play for about an hour total, but despite all of that Cantu was able to clinch his spot in the finals. Cantu held the chip lead going into heads up with Aguiar and came out with guns firing. All of that changed, however, during a hand where both players saw a flop of . Cantu led for 75,000 and Aguiar raised to 270,000. Cantu moved out a three-bet to 540,000 and Aguiar four-bet all in. Cantu held the nut flush but Aguiar was drawing live with his set of eights. The on the turn was of no help to Aguiar and Cantu was one card away from the championship. It was not meant to be, however, as the fell on the river and gave Aguiar a full house. 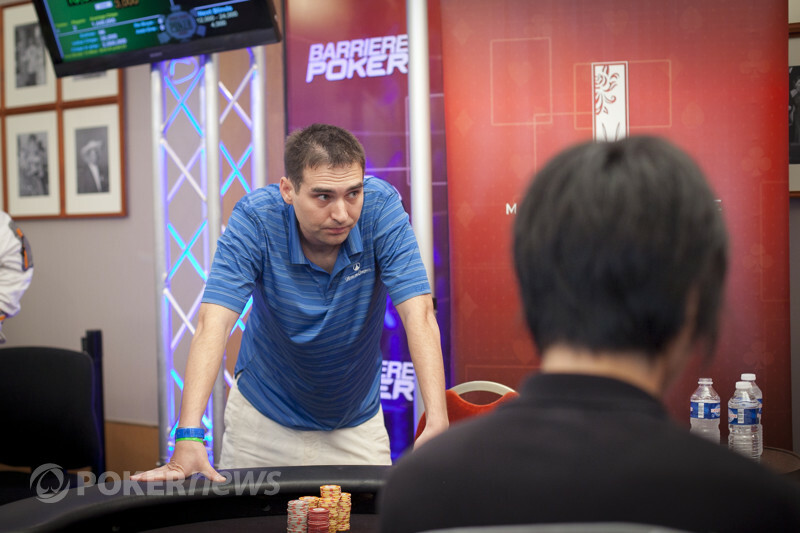 From there the two players battled for another roughly three hours and by the end of the night, Cantu was able to overtake the chip lead once again. Due to scheduling issues and the casino closing at 5:00 AM, the match had to be rescheduled to when both players were available after the Main Event. Both Cantu and Aguiar busted from the Main Event on Day 1 and so they were back to the felt the next day. The players were racing with Cantu's tournament on the line. The flop came down and Aguiar was able to pair his ace and jump into the lead. The fell on fourth street and Aguiar was one card away from the championship and his first bracelet. The dealer put down the on the river and Cantu's tournament was officially over. PokerNews would like to extend our congratulations to Jonathan Aguiar for conquering this stacked field to earn himself his first WSOP bracelet. That does it for our coverage of Event #5: €10,450 Mixed Max - No-Limit Hold'em, be sure to tune into our coverage of the Main Event! Jonathan Aguiar wins Event 5 10k Mixed Max. Aguiar sat with his hands clenched, looking up to the sky as the flop came. It was and Aguiar was able to take the lead by pairing his ace. The on the turn left Cantu with only two outs going to the river. It bricked out for him with the and Cantu was forced to ship all of the chips to Aguiar. Brandon Cantu will collect €159,459 for his second place finish. Brandon Cantu is internally steaming right now after a brutal river saw him drop even further in chips. Cantu opened to 40,000 and bet 50,000, 140,000 and 275,000 on a board. Aguiar tank-called on the turn but snap called the river. Cantu quickly, and confidently, opened before he was destroyed by Aguiar slamming down for a rivered two-pair. Brandon Cantu popped it up to 40,000 from the button. Jonathan Aguiar three-bet to 115,000 and Cantu called. The flop prompted Aguiar to continue for 115,000 and Cantu got rid of his cards. "I'm not going to let you win," said Cantu. "Just so you know." Aguiar did not reply as he scooped his chips and extended his chip lead. The spice in this contest from two days ago is still lingering today, and has the potential to travel right up the Scoville scale. Jonathan Aguiar is pulling clear after the two played out a hand that made it all the way to showdown. Aguiar opened to 40,000 and Cantu called before both players checked the flop. On the turn Cantu led for 55,000 and Aguiar called to the river. Cantu checked and tank-called a 135,000 after he muttered something about Phil Hellmuth. Aguiar responded, "Did Hellmuth turn you into a calling station?" And opened for two-pair. Cantu pointed out that Aguiar likes to hit rivers. Jonathan Aguiar held the button. He made a raise to 40,000 and Brandon Cantu called. The two saw an all-black flop of . Cantu checked to the raiser and Aguiar bet 47,000. Cantu slid out a check-raise to 140,000 which caused Aguiar to go into the tank for about ninety seconds. Aguiar then three-bet the action to 140,000 and Cantu quickly let go of his cards. With this pot the players have basically swapped chip stacks so now Aguiar has a slight lead. Brandon Cantu can't believe his eyes. Jonathan Aguiar can't believe he just won Event 5. Jonathan Aguiar waits for the river. 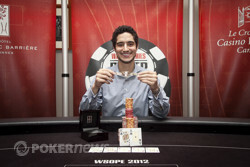 Jack Effel, Jonathan Aguiar (winner), Lucy Denos after Aguiar wins the WSOPE Event 5.